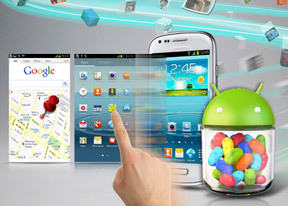 The Samsung Galaxy S III mini uses a 4" Super AMOLED screen of WVGA resolution (800 x 480 pixels). It's identical to the screens used in the original Samsung I9000 Galaxy S and the Galaxy S Advance and the image quality is about the same. The pixel density clocks in at 233 ppi, but since the AMOLEDs of that generation use a PenTile matrix, you can spot the familiar dottiness. It's not a big deal, but it's one of those things that once you spot, you can't get out of your head. All things considered, the Galaxy S III display offers more than decent image quality for a mid-range device. Colors a punchy, blacks are as deep as on other AMOLEDs and the viewing angles are extremely wide. There's some color shift when looking from an extreme angle, but the screen remains perfectly legible. 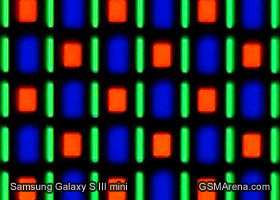 Sunlight legibility is also quite good, as testified by the Galaxy S III mini performance in our dedicated test. You can find more information on our display test here. 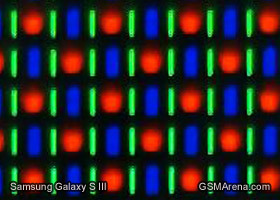 We also put the Samsung Galaxy S III mini screen under our microscope to show you its display matrix. The Samsung Galaxy S III mini is really easy to handle with its curved back fitting nicely in the palm of your hand. Single-handed operation is also always an option - one of the few areas, where the Galaxy S III mini beats the original Galaxy S III.